I'm from the center of the country, Omaha. 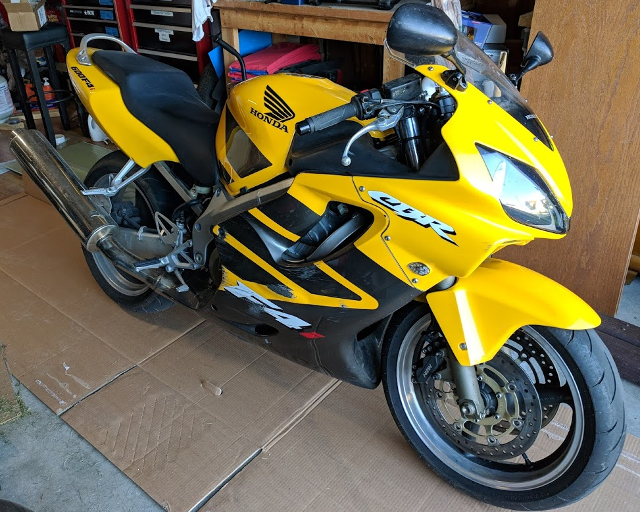 I've got a 2006 Honda CBR 600 F4i w/14XXX miles. I can't wait learn. I'm currently fixing some kluge jobs by previous owners in the lighting department. So far I've installed a new Motodynamics tail light with a sequential turn indicator and a blinking stop indicator. I'm running into the issue of there not being enough draw on the lamps that they fast blink. Someone before me used the cut-off wheel method to "delete" the rear fender, but thankfully left the factory mount holes for turn indicators.I'm going to throw some X-Arcs on the back to provide additional draw and throw some Proton 5000's up front so I get brighter front blinkers. I could fix this by installing a new blinker flasher somewhere in the wiring line near the front of the bike (as my bike has the turn indicator flasher within the speedometer, but I'll just try adding extra load first. I'm also replacing the grips and putting new bar ends on as it only had one. POs (Previous Owners) really PO you with sketchy decisions. If something is wrong or shoddy always blame the PO, at least that's how it works in the Jeep world. I hope to learn quite a bit just browsing about. And if anyone needs a wiring diagram for 05-06(? ), I've got one. So far, using Gimp (for linux, but Windows has a version as well, hell, even MSPaint would let you draw lines) I've managed to trace out all the grounds, and I've mapped out all the lights. Everything else is still in black and white as I don't have other systems I'm trying to run down at the moment. I'm sure y'all will correct me if I have the wrong diagram. Here's the imgur link with the PDF's (and a larger photo of the bike). Hopefully those stay true to size and can readily be read at 200% also. Anything bigger and it gets messy. Here's my ride. My daughter has named her Bumblebee. If something is wrong or shoddy always blame the PO, at least that's how it works in the Jeep world. Sport tire vs sport touring?